While both milk and half-and-half are good sources of protein and calcium, if you're looking for ways to cut calories and fat from your diet, you might want to consider substituting milk for half-and-half in your coffee. Half-and-half is actually a mixture of whole milk and cream, and for it to be called half-and-half, it must contain at least 10.5 percent milk fat. By comparison, whole milk contains just 3.25 percent milk fat. Knowing the nutrition information can help you see the significant differences -- and similarities -- between milk and half-and-half. 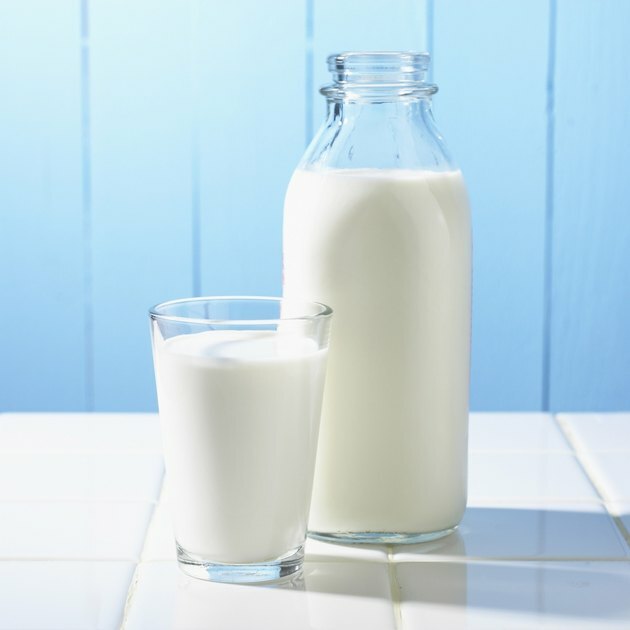 Half-and-half has twice the amount of calories as regular whole milk and four times the amount of skim milk. One tablespoon of half-and-half contains 20 calories, while the same serving of whole milk contains 9 calories and skim milk just 5 calories. So, if you're trying to cut back on your daily calorie intake and use half-and-half in your coffee, an easy way to cut calories without noticing is to switch to whole milk, or even better skim milk, to lighten your coffee. The other significant difference between half-and-half and milk is the fat content. One tablespoon of half-and-half contains 2 grams of total fat, 1 gram of saturated fat and 6 milligrams of cholesterol. The same serving of whole milk contains 0.5 grams of total fat, 0.4 grams of saturated fat and 2 milligrams of cholesterol, while the skim milk has no fat, saturated fat or cholesterol. The 2010 Dietary Guidelines for Americans recommends that you limit your intake of saturated fat to less than 10 percent of calories, or no more than 22 grams on a 2000-calorie diet. High intakes of saturated fat raises blood cholesterol levels and your risk of heart disease. So when it comes to heart-health, skim milk makes the healthiest choice. The carbs and protein in both the half-and-half and milk are very similar. One tablespoon of half-and-half contains 0.6 grams of carbs and 0.4 grams of protein, while the same serving of whole milk contains 0.7 grams of carbs and 0.5 grams of protein, and the skim milk 0.8 grams of carbs and 0.5 grams of protein. Carbs in food like milk and half-and-half provide your body with energy, while the protein is used to build and maintain muscles and tissues. Both the milk and half-and-half have about the same amount of calcium. One tablespoon of half-and-half contains 16 milligrams of calcium, while whole milk contains 17 milligrams and skim milk contains 19 milligrams. Calcium is a mineral that supports bone health. However, the half-and-half is a much better source of vitamin A than either whole or skim milk. One tablespoon of the half-and-half contains 53 International Units, while the whole milk contains 24 International Units and the skim -- which is fortified with vitamin A -- contains 31 International Units. Vitamin A is a fat-soluble vitamin that is important for eyesight and immune system health. Why Are There No Carbs in Half & Half?